Did you know? You can have a custom keynote created for your group based on the proven research found in Courtney’s books. 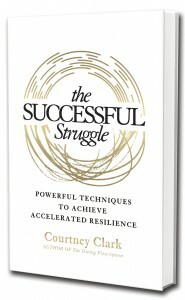 Courtney’s newest book, The Successful Struggle, features the right resilience tools for the challenges you are facing. Not all coping techniques are created equal. Choosing the wrong technique might actually get in the way of recovery. The research-based techniques in The Successful Struggle combine left-brain strategies with right-brain approaches. So you’ll achieve resilience faster than ever before! When change, chaos, or other struggles are getting in the way of your success, you need quick, proven methods to overcome. You need accelerated resilience. Courtney Clark offers a practical guide for overcoming challenges of all types. She offers powerful step-by-step strategies that will empower you to thrive in the midst of struggle. 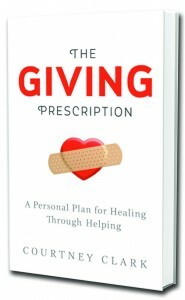 Learn about Courtney’s first book, The Giving Prescription. If you’ve suffered a loss or trauma – whether a life-changing illness, the death of a loved one, or a sexual assault – you probably feel that life as you know it has changed forever. You’re dealing with intense, draining emotions. You’re trying to negotiate a “new normal.” You’re wondering if you’ll ever fully rebound. Courtney Clark has been there. In The Giving Prescription she shares a fresh approach to the healing journey. The book focuses on the fact that helping behaviors like volunteering, donating, and advocating can help survivors find their footing after a trauma. Clark shares eight questions designed to help you reflect on what type of giving works best for you, and when you’ll be ready to try it. As she draws from her own experiences with cancer and brain surgery as well as other real-life stories, she shows how the power of helping others can transform your journey of recovery. As a three-time cancer survivor and someone who interacts with others affected by cancer each and every day, I have been a long-time believer in the positive effects of philanthropic actions while on the road to recovery. The Giving Prescription offers a model, based on scientific research and the experiences of trauma survivors, that will help you heal mentally and physically. Whether it’s cancer or another form of trauma that you have experienced, I believe that the information in this book will be incredibly valuable to you.